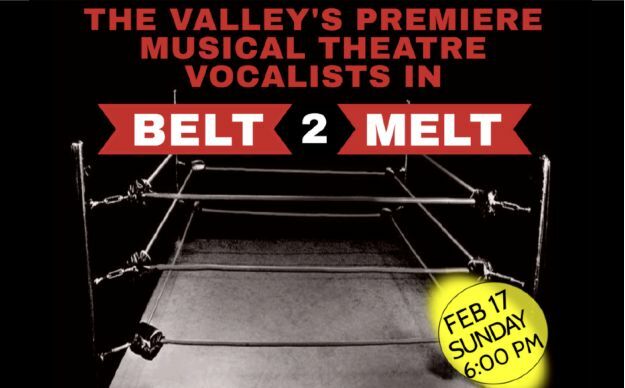 ​​The valley’s premiere vocalists “belt it out” in an evening of face melting musical theatre songs where you, the audience, decide who will take home the “Belt2Melt” belt. A/C Theatre Company, who specialize in alternative/commercial musical theatre productions, have gathered a cast of Arizona’s finest singers for a friendly belting competition to see who will be this year’s “Belt2Melt” all-star. Sixteen singers will present their best belting songs for the audience to judge and vote (with their dollars) which vocalist will have bragging rights as “Belt2Melt” 2019 Champion. All proceeds from the concert will help raise funds for A/C Theatre Company’s 2019 productions.